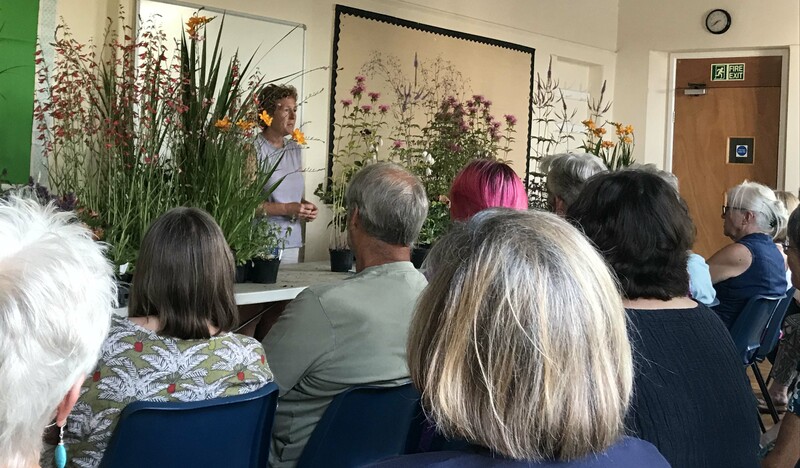 With exquisite timing, Rosy Hardy from Hardy’s Cottage Garden Plants, came to talk to us on 9th July about late flowering perennials, with an emphasis on those that would cope with drought conditions. As we were (are?) in the middle of a prolonged spell of dry weather this was very welcome and none of us could resist buying at least one of the beautiful examples she had brought to show us. These ranged from stately ‘prairie’ plantings of Veronicastrum and Thalictrum, to the more well-known Alstroemerias and Verbenas, Gaura and Salvia. All we have to do is keep our new plants alive while being sparing with our watering. Sybil also reported that the plant sale on 7th July raised just over £200 and as a result the Gardening Club would be presenting Bridewell Gardens with a donation of £100. Our next trip is a visit to Hidden Gardens of Burford on 16th July, then the Club has a month off in August. We next meet on 10th September when Graham Pavey will talk to us about Garden Design Techniques. All visitors welcome!